One key opens 2 locks. 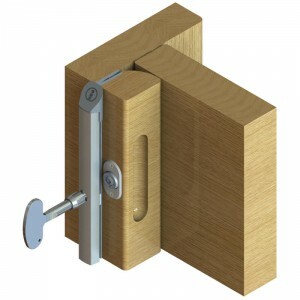 The SECURA™Stop Multilock is a full length, fire rated, stop mounted doorstop, ideal for bedroom and en-suite doors in mental health environments and light to medium duty applications. It’s single point operation (espagnolette system; one key opens 2 locks) streamlines locking and unlocking procedures, allowing quicker, easier access. By two locks engaging and unlocking simultaneously it guarantees when locked it is securely fastened in two places and does not allow for the one to be left unlocked. Patent application number GB 16 12 835.7. The SECURA™Stop Multilock provides a quick emergency outward opening operation of doors that normally open inwards, helping to resolve a number of problem areas including the elimination of barricade situations. 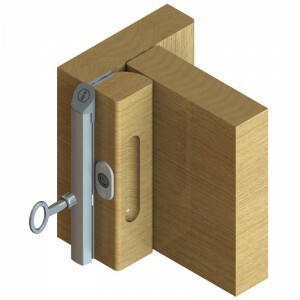 Suitable for pivot or floor sprung hinges as well as Intastop’s Double Swing Hinge. guarantee that it will not take place. The solutions have been designed as a deterrent only. Standard finish is Tulipwood and Satin Anodised Aluminium (SAA) as standard. Other hardwood timbers available on request. Please note hardwood options are a natural product and if not stored correctly or are subject to fluctuations in temperature/moisture may distort. Intastop have no control over this once despatched, and thus cannot accept liability. The standard finish is Tulipwood. Other hardwood timbers available. Please note that hardwood is a natural product and if not stored correctly or is subject to fluctuations in temperature - moisture may distort. Intastop have no control over this once despatched, and thus cannot accept liability. Please specify at point of ordering if the product is Left or Right Handed.